NAMM 2011 PRESS RELEASE: Combining the dynamic sound quality of the popular P2 and P4 Microphones with a rugged P 17 Condenser microphone, three mounting clamps and two stand adapters, AKG's comprehensive Drumset Groove Pack offers drummers and percussionists an all-inclusive solution for live and recorded sound. 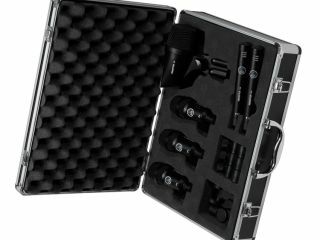 The Drumset Groove Pack comes in an all-metal carrying case with a total of six microphones for bass, drum and overhead positioning. The two overhead P 17 condenser cardioid microphones with the Drumset Groove Pack offer a level of precision that is normally found in a higher cost, small-diaphragm condenser. With an all-metal construction and a switchable 20 dB attenuation pad, the P 17 is a ½ - inch small diaphragm instrumental microphone, perfectly suited for overhead positioning. "The Drumset Groove Pack offers percussionists the most comprehensive set of extremely rugged, highly versatile microphones," said Thomas Umbauer, Product Manager for the Drumset Groove Pack. "They are the perfect solution for any drummer or percussionist looking for powerful, dynamic sound quality." Also included in the package are the P2 bass and P4 drum microphones from AKG's Perception Live series. The P2 is a dynamic mic designed to provide low-frequency instruments with a powerful sound and a wide, dynamic range, while the P4 is designed to handle the highest sound pressure levels with a response specifically tailored for neutral reproduction of instrument sounds. Both of the mics come with a rugged, all-metal body to withstand the typical tough stage use, an intergraded stand adapter and external bracket, and a hum compensation coil that rejects EMC noises. In addition to the microphones, the Drumset Groove Pack includes three H440 mounting clamps and two SA60 stand adapters, packaged together in a highly resistant metal carrying case. AKG Groove Pack is expected to ship in February 2011 with pricing to be confirmed.